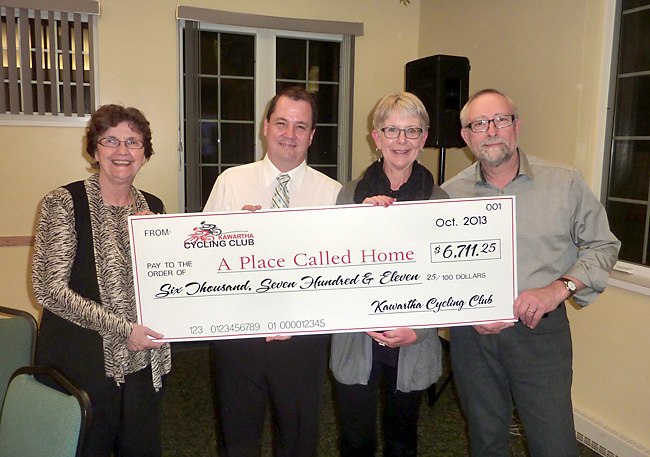 The Kawartha Cycling Club presented A Place Called Home with a cheque for $6,711.25 at its annual banquet last night in Lindsay, Ontario. The number represents net funds raised during the annual Kawartha Lakes Classic Cycling Tour that was held on September 21st this year. The event attracted 80 cyclists who rode in a steady downpour to benefit the Lindsay homeless shelter. Pictured from left: Zita Devan (of APCH), Craig Wilson, Deb Smith, and Gunter Meyer. Photo by Andrew Staneland.